CEntrance has just released their new HiFi-M8 (pronounced HiFi Mate) battery-powered portable DAC and Headphone Amplifier. The HiFi-M8 can stream high-resolution audio from smartphones, tablets and laptops. The new HiFi-M8 is offered in a number of output configurations including XLR, 1/8″, 1/4″ and SPDIF optical. HiFi-M8 models offer a choice of output jacks to match various headphones, including a HiFi-M8 PRO model that is designed specifically for the professional audio market that provides male XLR jacks and +4dBm line-level output. The HiFi-M8 LX model features an optical / Toslink SPDIF input instead of the iPhone input. All models also offer a 24-bit/192kHz USB input for use as a portable USB DAC. For extra sonic flexibility, HiFi-M8 offers a number of tone shaping controls to EQ and customize the sound. The HiFi-M8 is available now at a MSRP of $699.99 U.S. 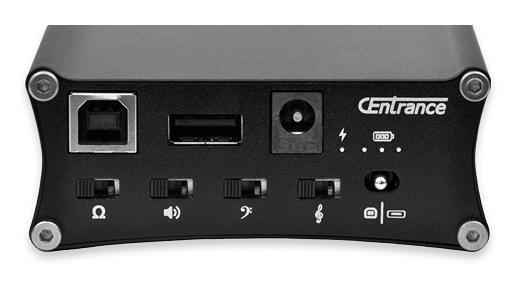 While the HiFi-M8 PRO has a MSRP of $599.99 U.S. Look for more information on the various models at: www.centrance.com.